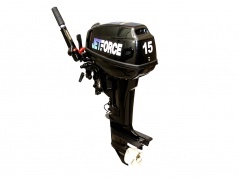 On this page you can find and free download user manuals for Jet Force outboard motors. The Parsun Power Machine Co., Ltd, a US-China joint venture formed in 2001 in the city of Shuzou, located near Shanghai. During its operation, the company has done a great job, becoming the second brand in China after Mercury. Ensuring that the company is constantly improving its production, seeking to improve the quality of an already reliable product, will help the fact that the plant is constantly being upgraded. So, for example, since its inception, the company turned from a simple assembly shop (until 2009, the factory didn’t produce parts) and turned into a company that itself produces parts and components in a volume that satisfies not only its own needs, but also requests from other manufacturers. Engines have relatively low noise levels, especially at low revs. This is achieved by the installed silencer, which reduces high-frequency sounds. Your attention will turn a pleasant and rolling growl of the motor as a real beast. The motors of the motors are equipped with a vibration damping system, even for low weight motors. You will not get tired of using the outboard motor even after a long engine running time.